Amazon FBA Business: How Much Money And Time Before I Got Profit? I have been working on a new business venture for a few months now: an Amazon FBA business. As this was a completely new venture for me, I made huge mistakes which resulted in huge loss of $$$ but luckily, this being Amazon FBA, my mistakes didn’t result in loss of time. Time is much more important to me than money. This is one of the reasons I chose Amazon FBA. I’m NOT saying: do Amazon FBA. This was my decision. It looked right for me considering where I was in business and life at the time. But it certainly won’t be for everyone. OK. If you’ve made the decision to sell physical products on Amazon, what’s the next step? This is really hard. You’ve read all the blogs. You’ve listened to all the podcasts. You’re itching to get going. However, there’s a really important decision to make, and you’re going nowhere until you’ve made this decision. For me, I had to find a product that I was passionate about – a product that would make peoples’ lives better. However, I know not everyone will agree with me about this. There are some tools to help you research the Amazon marketplace quick for the products with the above criteria. 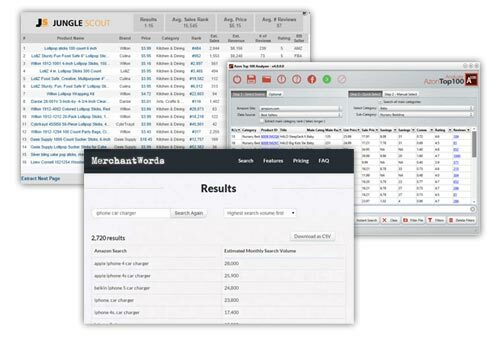 Firstly, MerchantWords ($9/month through that link – not an affiliate link but the rest are! ), provides you with the number of searches per month on Amazon for keywords. Amasuite ($297, one-off fee) is a suite of tools. The most useful for me is the Azon Top 100 Inspector which (as its name suggests) analyses the top 100 products in any given Amazon sub-category. It allows you to find products within certain price, size, and profit range which also have comparatively low numbers of reviews. This tool side-steps trawling through hundreds of Amazon pages hoping to spot a potential product. JungleScout ($147, one-off fee) is a Chrome extension that provides excellent information on Amazon products. The extension will show you the estimated sales, estimated revenues, number of reviews, ratings and sellers’ status (FBA or not) of products on any Amazon page. This enables you to see, almost instantly, whether a particular category or keyword is worth competing for. I bought all three of the above tools and they all helped me choose my first product. It really helped me find a range of products that sell well, provide profit and, most importantly, have low competition. This is something that will take a great deal of time and something I can’t help with much. Sadly it’s a case of trawling through Alibaba and AliExpress and contacting dozens of suppliers and paying for many samples to be delivered by courier. What you’re looking for is good communication, good quality products and products that can be unique in some way. (See next section on design). You have to compete against the hundreds and thousands of other sellers out there so your product has to be of the highest quality and you have to have the best supplier possible. This is another stage of the process that will and should take a considerable amount of time and money investment. It’s painful because, again, you’re itching to get started. But this stage is critical. And if that all wasn’t enough, you also have to decide on the name of your brand! I found the free tools LeanDomainSearch and BustaName useful for this. I wanted to choose a brand name that I could get the dot com for. It also confirms that no one’s taken that particular domain as a brand name although you should double-check this as well. I used 99designs and Upwork. I like to find good designers by browsing 99designs, contacting them through the site and getting them to work on projects for specific fee. Much better than their practice of getting designers to work for free in a contest. Personally, I hate running contests on 99designs – the designers only tend to spend 5 minutes on a design and re-hash old projects. Talking of bad practices, I find Upwork’s site and a support department lacks customer focus. However, you will always find good freelancers there if you’re prepared to put in the time to find them and pay decent hourly fees. Spy on competitors for inspiration. The packaging and brand design cost me a total of $500. But bear in mind that I’m from a design background. If there’s anything I’m good at outsourcing, it’s design. I understand how lazy designers are and how to get the best out of them. (I was the laziest designer in the world). 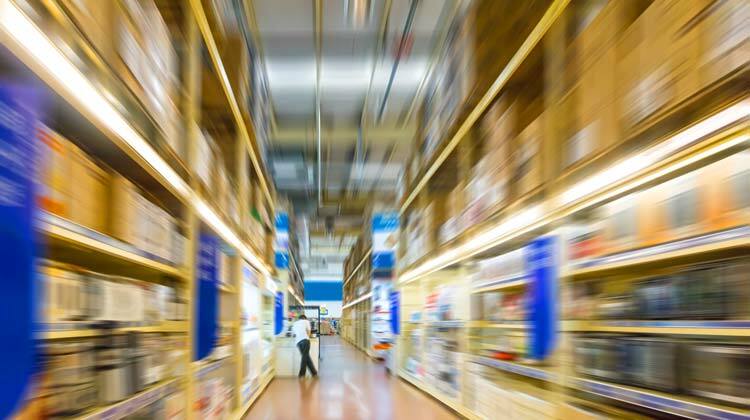 The time it takes from product and supplier choice to selling on Amazon? Phew, for me, it was 3-4 months. Most of the hold up was the design stage. Otherwise, the time delay of getting the first units of a product from supplier’s order to selling on Amazon could be 2-3 months. I had no prior experience of physical goods e-commerce business and no prior experience of an Amazon FBA supplement business. This was all completely new to me. The cost of getting the first few hundred units to Amazon’s facilities was: $3,800. Well, no. Actually, I didn’t even make a running profit on most of the first few hundred units. 🙁 Yes, I’m saying you can pretty much kiss goodbye to four grand! In fact, it gets worse. In order to get reviews I offered coupons for 90% off to Amazon users in exchange for an honest review. This is extremely costly. Not only are you losing money as you’re virtually giving away the product to the reviewers, you also have to pay a subscription to allow you access to the reviewers (through AMZtracker or Snagshout). Note: you don’t actually pay for reviews, that is against Amazon’s TOS. But you do pay subscriptions to allow access to review groups. No one is under any obligation to give you a review, good or otherwise. I would add another $1200 that I spent to get 100 or so reviews. It is possible to do this with less money. I made costly rookie mistakes with the promo coupons. I also lost my buy box to people who’d snagged my product in a review club and then re-sold it on Amazon. Ouch! But that brings the figure to start my Amazon FBA business to a nice round fat five grand – $5000. Calculating profit margins – on a per unit basis! Inventory plus shipping to Amazon divided by the number of units: $4.31. The Amazon fees (variable closing fee, pick and pack, weight handling, etc.) are $6.17 per unit. $6.17 + $4.31 = $10.48 cost per unit. So, if I price my product on Amazon at around $21, I’ll have around a 50% profit per item. But this is not counting the expense of Amazon Sponsored Ads (otherwise known as Amazon pay per click or Amazon PPC). You pretty much have to spend money on Amazon PPC right from the outset. Amazon PPC is the only way you get certain customer information. Amazon Sponsored Ads tell which search terms are performing best for your product. Then, armed with this information, you can target those keywords both in campaigns and super-URLs. As the acronym PPC suggests, you pay per click with Amazon’s Sponsored Ads. You pay to get the information, you pay to optimize the ad settings and then, hopefully, you make a profit. I’m about breaking even at this point. Calculating profits – on a per unit basis! Amazon pays you twice a month. They have already subtracted PPC and their fees from it. I find it’s best to take these payments and subtract the cost of manufacturing and transporting that number of units to Amazon – in my case this is $4.31 per unit, see above. So for May 2016 my profit on a per unit basis is: $1,133.82. I still have to keep on promoting the product, I’m thinking of doing a Zonblast to get another load of reviews and move me up in the rankings for my main keyword. If I do this it’ll basically wipe-out May’s profit and then some. But there may be greater profits to enjoy after that. So, I certainly wouldn’t say “$5000 is enough to invest before you turn a profit”. The situation is more complicated than that as I hope I’ve explained above. I’ve been earning over $5000/month passive income profit from selling e-books and video courses for nearly two years now. That money has built up in my business’s bank account and that’s why I think this Amazon FBA business is worth pursuing. Is it right for everyone? Hell, no! Read the above article and if it’s too scary – don’t do it! Another important point is that I got great advice from many friends and I paid for some top consulting. I really pays to talk to people who’ve been there, seen it, done it. If you follow my quarterly income reports, I’ll be referring to this article in them. I wanted to make my income reports proper profit reports but I’m not going to count the first $5000 investment in this business when I report next. Do you think this is fair? Rob thank you so much for posting such great details about this. I have to say this is something that has never interested me for various reasons, but I’ve always wanted to learn more about how it works. And this is the most detailed post I’ve read from someone I trust. I appreciate you saying that it costs money. People need to know this. Thank you, thank you! Really good review Rob. Very detailed and honest! This is why you don’t always jump on a bandwagon. Thanks Rob, you helped me dodge a bullet. I have taken two courses on this exact business model in the past three weeks. Neither author of these two courses mentioned that you would most likely lose money in the Thousands before you cut a profit on a sale. I was in the process of researching products to market, and had set aside 15K for the venture. Now, I think I will stick to what I know (Ebay)and look this over a little more closely before putting any cash into it. Your email arrived in the nick of time. Again, Thank you for your transparent analysis. There does seem to be a lot of misinformation out there about Amazon FBA and I did want to redress the balance and bring everyone back down to earth. The most helpful thing you can do is talk to someone who is successful on Amazon FBA as then you’ll get something straight from the horses mouth. Unfortunately, some people make courses on Amazon FBA who don’t ever do it. However, you do have experience with Ebay and e-commerce, Ron, so I also wouldn’t discount this model completely. The product I chose sort of demanded this level of investment. Other products may not be so pricy. Good advise, I have to admit that I’m still intrigued with the model, and have decided to retake the courses and maybe go a bit slower. The similarities between what I’m doing now and what I am exploring with FBA are many, so learning the differences better could maybe make the experience more profitable from the start. Hi Rob, for me this article was interesting to know the services and tools you use for research and development. The setup costs, in my opinion, don’t seem to costly; I think you did well with this to be honest. When you order your product from China do they send it to you first? Would you then package it yourself and send to Amazon? Not sure how you get your product to supplier/seller Amazon and you would then have costs, time, and space needed. I’ve ordered from China and they are not always reliable; sometimes taking up to 3 months to deliver. Hello Fiona, well, yes, let’s remember $5000-$10000 to start a great new business was completely unheard of before the internet! However, you can start and online digital products or service business with next to nothing – just a lot of work! Yes, you can get the products sent to your house and package them to send to Amazon if you wish. This way of doing things certainly has its benefits (you can check the product). However you can also transport your products from the docks to the Amazon facilities. The last step of this is done via SellerCentral, you enter the weight and dimensions of the boxes and get stickers to put on them so Amazon knows what to do with them. I have been following Rob’s site for a while now. He always provides genuine value. Thank you Rob! Thanks Rob. The time of posting this was absolutely perfect! Just yesterday, my wife was asking about selling with Alibaba, etc. as she had been watching and listening to all the online hype about how people were becoming overnight millionaires. I tried to explain to her the “method behind the madness” but your post pretty much nailed all the points I was trying to get across. This is a good reality check for everyone to consider before diving into the hype. I will be sharing this with many of my followers, if you don’t mind. Thanks again! hello Rob, your post is worth reading. you are very true. I am just putting money on this business without any returns yet, but hoping to get it certainly. The more investment I made is for learning how to set-up and run the physical product business on amazon, and now I am investing on product development and launching. Lots of money is going out now, but have hopes to return it back. Anyway, thank you very much for sharing your valuable experience. I hope you see the returns soon, Giri. As long as you’ve done your sums, you have about 50% on the product before PPC, and you’ve got the money, it should be OK. I should be in profit in 5 months at this rate so that’s not bad. And, if I have the money, I will launch more and more products. Your level of detail is high per usual! I read several ebooks on selling on Amazon a couple of months ago. Those books covered sourcing, importing, shipping, and taxes in detail. But most importantly, they said what it’s going to cost you to sell on Amazon, and they said how you can lose that money! Very nice for interested folks to have you cover that territory here on your blog! Hi Rob, thanks for great article and presenting Amazon FBA business model from different angle. 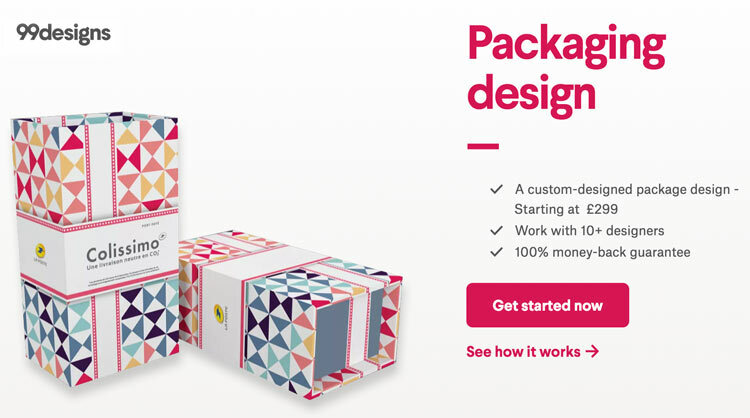 I have one practical question – once you had your packaging designed, how did “put” your product in your packaging? You said you get your stock delivered straight to Amazon warehouse, so am I wrong in thinking that you asked your supplier to package your items? If so, how hard/easy is it to convince your supplier to do it and how much do they charge for it? And what about quality check of packaging – they might be great kitchen tools producers, but have no experience producing good looking, colorful boxes? I hope your business is just getting started and you will find a great success with it and will be able to share your adventures with us in the future! Hello Bart, this would vary from product to product, supplier to supplier. Some suppliers do the packaging and packaging printing however, it’s more likely that you’d get another company to do this. The supplier can often recommend one because they’re likely to have done this for someone else in the past. The suppliers are used to packaging items. But it’s always a good idea to employ a company to check the shipments before they leave the suppliers. But all this is really dependent on what product and supplier you choose and doing research on the back of that. So as I understand it, if supplier doesn’t/can’t make a packaging for us, but we find someone else in China that can make packaging for us, this company will send packaging of our choice to the supplier and supplier of our product will pack our items, is that correct? Of course I understand it’s not always the case and some suppliers might not agree to this arrangement, but I’m trying to make sure I understood your post. Also, if you don’t mind sharing, how did you sort it out? Was your item packed by your supplier (whether they made packaging or not is not important) or did you have some 3rd party do it for you ie. they received product and packaging and combined the two and then sent whole stock to Amazon? Thanks again for sharing your experiences! Hello Bart, yes, it’s going to be different for everyone but in my case and I think a lot of other cases the supplier or manufacturer packed the product with the packaging provided by the packaging printer. I hope this helps. Let me know if you have any questions. That’s a really informative article, Rob! However, Amazon FBA business is quite far away for me as I am quite new to the online world. Currently, I am working on multiple niches sites (most of which are Amazon niche sites) so Amazon FBA is not the right thing for me now. However, this article showed me everything I needed to know about the online business. Well, James, thank you very much but I don’t think this article shows you everything you need to know about online business. Also, you will be getting good experience from the Amazon niche sites. Hi Rob. Good info. I’m curious.. Months later, have you realized any gains? Can you better see future potential? Hi Ron. TO be honest, no. I’ve spent even more money! I’m going to explain why later. but, I’m making $10-50 per unit profit everyday so I see potential in this model. Could you please do an update? Your article is fascinating! There’s all of these classes on Udemy about FBA but I’ve never heard of the tools you’re using (which sound like a solid investment) or the downside(s) you describe. I appreciate your balanced reporting and would like you to keep us all informed of your business. I was really surprised to learn about Amazon’s PPC advertising – is this the most effective means you’ve found to attract customers? 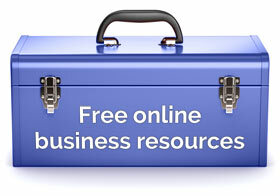 Other FBA instructors mention buying just 1 item and having it shipped to you for inspection. Were you able to do that? And what is the “buy-box” and the problem you had there? — I’m totally in the dark. Also, I realize you gave a list (extremely helpful!) of criteria for choosing a product but could you explain how you then used this to find your item(s) and then decide on your pricing structure? I’m not sure this is the business for me, but I’d like to have a clearer picture of what’s in store if I do decide to go this route in the future. Lastly, I’m one of your Udemy students and I appreciate very much your clarity. Hello, Margaret, thank you for your comment. The classes on Udemy and elsewhere about FBA have to paint a rosy picture in order to get you to part with your money. yes, PPC is the most effective means of attracting customers. Other than that it’s optimizing the listing and getting ranked for more organic (which is more PPC). I had a sample item delivered, yes. You can “lose the buy box” on Amazon if someone else supplies your product, through FBA, at a cheaper price than you. I decided upon the product by analysing the competition and prices that exist on the first page of the main keyword on Amazon. First time on your blog, Rob. You served me with a freshly baked guide. Rob, this is an awesome venture – trying something new out of millions of people. This Amazon FBA niche is a million niche and requires cash to start it . Thanks for this , God bless you bro! Thank you, Joseph, yes it requires cash to start but still a good business opportunity in the right niche. Great information. I have been thinking about getting into this for a while. Your blog is very detailed and realistic. You mentioned that the product’s Amazon selling price should be $15 – $50. Would it be wise to start with only one product or with a few products at the same time? Also how many units of the chosen product would you buy at first, to start this activity? Hello John, sorry it’s taken me so long to reply to your comment. I’m not the best person to answer your questions as I’m not an Amazon FBA expert and I’m not successful at it. 1. Depends on your budget. But I would start with one. 2. Depends on your budget. And it depends on the product. Most suppliers will give you a minimum quantity. 200 or something like that. I hope this helps. Let me know if you have any more questions.